ABSOLUTE AND TOTALLY BEACH FRONT! Situated at the northern end of Paraparaumu Beach this beach house exudes a holiday and relaxed feel and has been set up by the family as their beach house. It has a very interesting design giving plenty of space for everyone to spread out without being on top of each other. It has plenty of light and sun with high ceilings and interesting nooks including sleeping lofts in the ceiling space. Its relaxed garden with Pohutukawa trees gives plenty of privacy. Prime views of Kapiti Island and the ocean. The sun rises over the hills and sets over the Island. The house looks and leads directly out onto the sand dunes, sea and Kapiti Island. Kitchen/family area and rumpus both open to a sheltered, fenced and paved outside area with BBQ. Walk through the back gate onto the sand dunes. Great for an extended family stay or just for the two of you with room for friends. Bring your togs and swim from our safe sandy beach, set a long line to catch your tea, fly a kite or ride your board or just walk over the dunes to catch what's happening - the options are limitless. The house has plenty of off street parking and also has a boat launching access just down the street. A wonderful place to get away to, yet close all amenities. Easy walk to supermarket, off-licence and takeaways. Book the ferry over to Kapiti Island bird sanctuary for the day. Enjoy world class Paraparaumu Beach Golf Course, Southward's Car Museum, ten-pin bowling, Nga Manu Nature Reserve, Paraparaumu cinema or take the rail from Paraparaumu to Wellington city. The house is light and airy and comprises 4 bedrooms with a modern kitchen/family dining area leading through to a large rumpus room with a separate lounge upstairs opening with folding doors to balcony. The main bathroom comprises bath, separate shower, WC and vanity with hairdryer and heated towel rail. There is also an ensuite to the master bedroom with shower WC, vanity and heated towel rail. For convenience there is separate WC off the laundry at ground floor level. Kitchen: Pantry, Dishwasher, fridge, microwave, ceramic hob, electric wall oven, toaster, etc. Rumpus: Table tennis table, one or two swing hammock chairs and various seating, kids toys. Double Divan. Laundry: Washing machine, ironing board/iron in long cupboard, dryer in garage, clothes line outside back door of garage. Garage: Double but may already be in use. Houses two BBQs and clothes dryer. Clothes line is out the back door. Young children need to be supervised around stairwells, lofts and deck. We have spent many years living on the Kapiti Coast and now retain this house as our family holiday home. We bought the house because we love everything about the coastline between Paekakariki and Waikanae and the magic of Kapiti Island. Here we found it all. The house itself we found very appealing and enjoy the quirkiness of the design. We can see Kapiti Island in all its lights right up to the sunset at night. The garden has everything, a bit of lawn for the kids to play, a paved area off the house for socialising/bbqing and all quite private. But the real magic is the sound of the sea and having our own gate to the beach to go there whenever we feel. Spacious architecturally designed home with plenty of space for everyone to spread out and enjoy. It has a laid back holiday feel with seclusion although close to all amenities. We love the roofline too enabling open ceilings and the ladders to the two sleeping lofts. Family bathroom on first floor has separate shower, bath tub, toilet and vanity. The master ensuite has separate shower, vanity and toilet. There is an extra toilet with handbasin on the ground floor next to the laundry. Can see the waves rolling in from upstairs. There is 2 parking space beside garage, and two in front of house with a possibility of garaging space for small car. Two spaces for smaller cars but often one space would already be in use. Full height with separate freezer area. It has a wall oven and separate ceramic hob. There is generally the skeletal basic items. Loads of dishes, cutlery, utensils, servicing dishes, wine and drink glasses, plus plastic glasses. The kitchen is large with separate pantry. The bench is a U shape overlooking the dining area. The laundry is through a sliding door to the side with the 3rd WC off. Large table with 8 chairs open plan to kitchen. Also has a 3-seater sofa and bookcase. Leads into rumpus room or upstairs to lounge. Smallish fenced area big enough for small children to kick a ball. There is a balcony off the lounge room with some outside chairs. There is an outside paved area before the grassed area which is accessed from both the dining area via French doors and the rumpus room via sliding doors. The house is not suitable for people who cannot manage stairs because of the different levels. Children love the stairwells and different levels including very small children but they do need to be supervised of course. We had such a wonderful time. It feels like we are coming home each time we stay here. It is such a pleasure to hear someone enjoys the place as much as we do. Lovely house with everything you need. Loved waking up to the most amazing view. Easy to find and right on the beach. Loved our stay. Lots of stairs in house though. Didn’t worry us but if you don’t like going up and down stairs it may be a problem. Very beautiful Place to stay !!! Thanks Josef - really pleased you all enjoyed your stay! We loved this place. It is well appointed, with two bathrooms and three toilets and a big kitchen, two BBQs, direct access to the beach, a big backyard and a balcony with amazing views of Kapiti island. I highly recommend it. Great location and awesome home. Only down side to our stay was that it was not long enough. We would like to stay longer in this great house next time as it definitely suited our needs. We love Kapiti and this home. Thanks heaps. 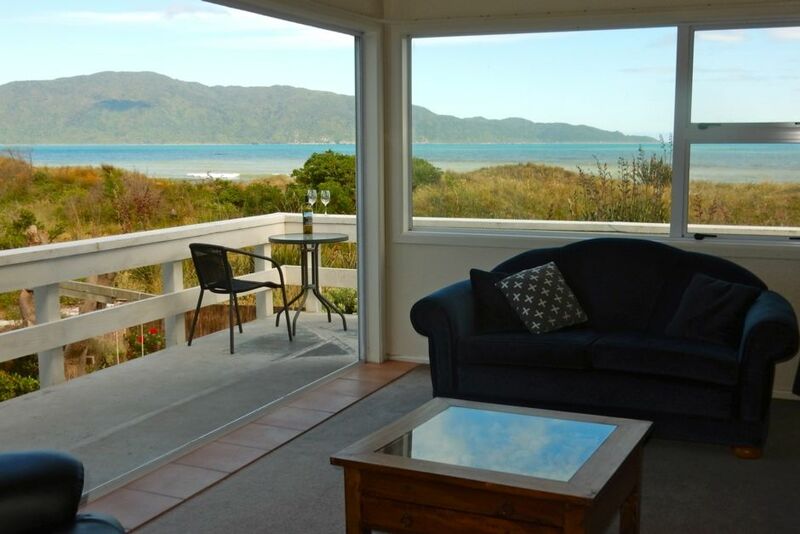 The property is only a stroll along the beach to the Waikanae River estuary which is a protected area for birds. If you are into walking or cycling at the northern end of Manly Street where it joins the estuary there is a walkway which takes you up to Otaihanga and then after crossing the bridge at the reserve you can travel either to Waikanae township or Waikanae beach to the cafes there. South along the road or beach is the Paraparaumu Beach township with shops, cafes, restaurants, a children’s park, skateboard park, and the boat club on the northern side of the stream. The famous Paraparaumu Golf Links is also within this area. Kena Kena Shops are very handy to the property via Ngapotiki Street and has a supermarket and various takeaways.